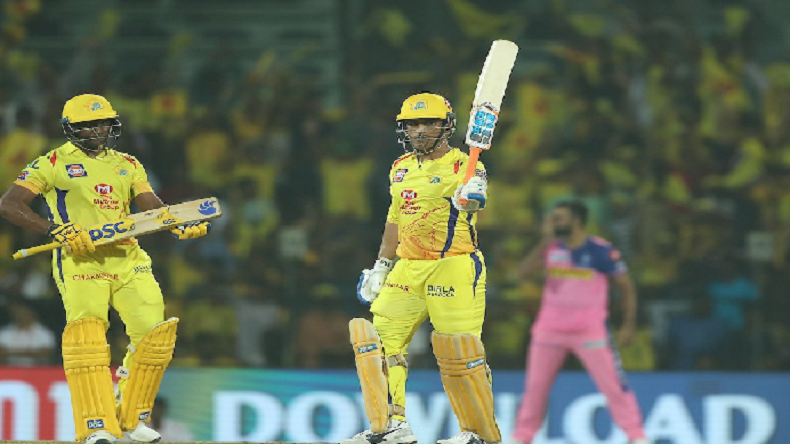 IPL 2019: MS Dhoni-led Chennai Super Kings beat Ajinkya Rahane-led Rajasthan Royals by 8 runs, register third consecutive win:Chennai Super Kings registred their third consecutive won in the Indian Premier League (IPL) 2019 by defeating Rajasthan Royals on Sunday. Mahendra Singh Dhoni-led team beat Ajinkya Rahane-led team by eight runs. The team did not allow Rajasthan to open their account in this season. Chasing down the target of 175, skipper Rahane was dismissed on the second ball of the first over. Deepak Chahar claimed his wicket without troubling the scorer. In the third over, second wicket of RR fell. This time it was Sanju Samson who scored a ton in his last match. On the very next ball, Rajasthan lost Jos Buttler. Samson made 8 runs while Buttler scored 6. After that Rahul Tripathi and Steven Smith took the score to 75. Before they could proceed near to 100, Tripathi was caught and bowled by spinner Imran Tahir. On 94, Tahir struck again and dismissed Steven Smith. The team needed 79 off 36 balls with five wickets in hand. The score went down to 12 in six balls with Stokes and Jofra Archer on the crease. Skipper Dhoni handed ball to experienced Dwayne Bravo who dismissed Stokes on the first ball. He did not allow Rajasthan to score more than three runs and picked another wicket on the fifth ball. This time he dismissed Shreyas Gopal and Chennai won the match by eight runs. For Chennai, Deepak Chahar, Imran Tahir, SN Thakur and Bravo claimed two each wicket. Batting first, Chennai also did not get a decent start, instead three wickets were dismissed on 27. Opener Ambati Rayudu was departed in the second over on 1 run, Shane Watson was sent back on 13 runs and Kedar Jadhav was dismissed on 8 runs. Suresh Raina and skipper Dhoni took the score to 88 in the 14th over. In the same over Raina was clean bowled by Jaydev Unadkat on 36 off 32 balls. Then Dwayne Bravo joined Dhoni who propelled the score near to 150 in the 19th over. Bravo played a cameo of 27 in 16 balls. In the last over Dhoni and Jadeja made 28 runs with hitting four sixes and set a total of 175. Dhoni remained unbeaten on 75 off 46 balls while Jadeja made unbeaten 8 off 3 balls. For Rajasthan, Jofra Archer picked up two wickets while Dhawal Kulkarni, Ben Stokes and Jaydev Unadkat claimed one each wicket. With today’s loss Rajasthan has lost all the three matches, it played so far.